Since 1949 our camp has been a wonderful place for people to meet, fellowship, and be inspired. Please read our testimonials and we hope you will add one as well. People call this a “very special place” for good reason. Thousands who have spent time here have found an atmosphere conducive to making them a better person. They may call it a respite, escape, peace or inspiration. It’s the transformation you experience when life’s distractions are pushed aside and your mind is refreshed and renewed. Our job is to make that transformation easy. Whether you are a huge youth group, a scrapbook club or corporate team leader, if outcomes matter, this is your very special place and our team is anxious to serve you. Welcome to the Gunter Camp & Conference Center! Our 25-acre retreat center is located at 1420 Nazarene Road, Batesburg, SC 29006; only 30 minutes west of Columbia, S.C. in rural Aiken County. It is owned and operated by the S. C. District Church of the Nazarene, and includes a dining and conference center, a tabernacle seating 800, dormitory and motel accommodations for 270, chapel, amphitheater, lake, ball field, swimming pool, and approximately 100 privately-owned cottages. We are members of the Nazarene Camping Association. 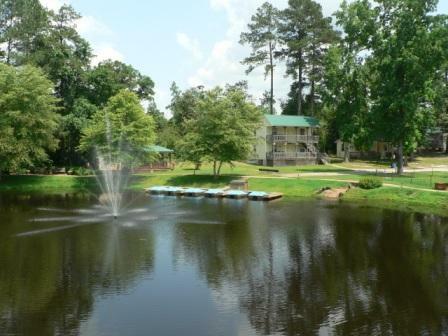 We offer our facilities for use not only by groups from the Church of the Nazarene but also by other similar faith communities in South Carolina and the surrounding area, as well as schools, businesses and other organizations for camps, retreats, reunions, and conferences. We have hosted camp meetings, youth camps and children's camps, Hispanic weekend retreats, family reunions, and such organizations as Walk to Emmaus and Via de Cristo. Scrapbooking groups and quilters guilds have had weekend sessions with us, and we have had a variety of weekend retreats for many various groups. We encourage you to browse through our Website. Whether your group is large or small; whether you have a day function, a weekend, or a week or more, we'll be happy to talk with you about how we can meet your needs. Thanks for stopping by our site; we hope to see you soon!